We had a couple breakthroughs in our eating out adventures in the last couple weeks. I’ve mentioned before that it’s tough to find a vegetarian meal in Japan without going to a speciality shop, which are also few and far between. The awesome website vegi-navi.jp is starting to change that. Sites like Happy Cow are great, but they tend to focus on vegetarian/vegan-only places. Vegi-Navi adds in the local places that might have only a single veg meal on the menu, which is all you need sometimes. We were in Tokyo last week and ended up getting a couple good meals out. 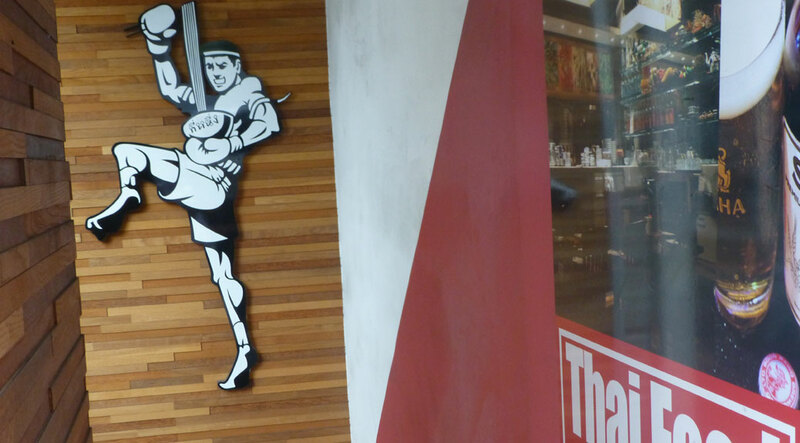 First stop was Tinun, a Thai place in Omotesando across from the Toyko Metro station. The lunch menu was NOT vegetarian-friendly, but the waiter was very helpful. We explained our eating preference and together we came up with a couple dishes that could be modified. We ended up with Pad Thai with tofu and a Thai Fried Rice. Both were really good. This Taiwanese place was a hole-in-the-wall down a side street. Always the best! We were back in Ikebukuro around dinner time, so we headed toward one of the places we’d pre-mapped. We came out the wrong station exit, but fortunately I recognized the landmarks for another place we’d pre-mapped! According to vegi-navi, it’s called SENJOUTEUCHIGYOUZATEN. The poster inside the three-table restaurant said “Sen Jou Dumplings,” which is both accurate and easier to say. 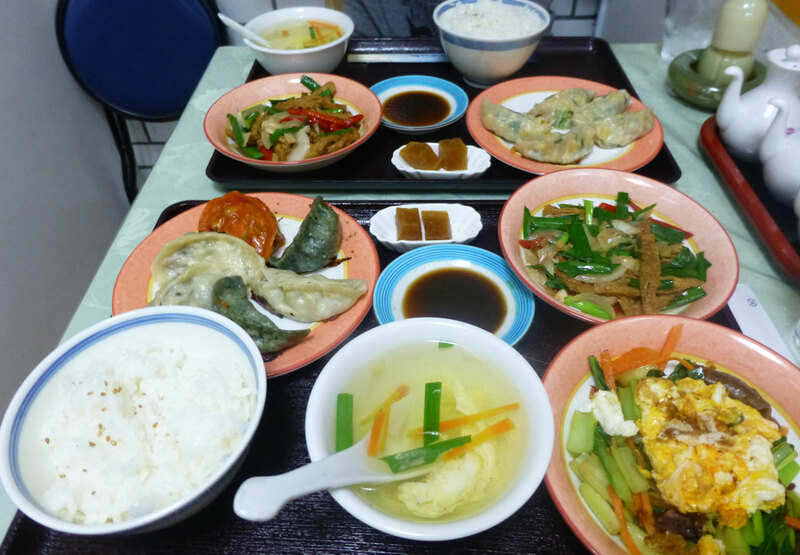 The owner, I’m quite certain, sold us the veggie gyoza at the Taiwan Festival we attended in our first week in Japan. Her first question was “Are you vegetarian?” which was a good sign. She had a nice mix of veggie and meat options, but two complete vegetarian set options. We ordered one of each and got a table-load of food. Multi-colored gyoza, rice, veggies, soup and a mock-meat stir fry. As we left, she introduced us to the cook—who also happened to be her mother. I told her we were already contemplating what we’d order next time. Vegetable tempura set from Tempura Tendon Tenya. 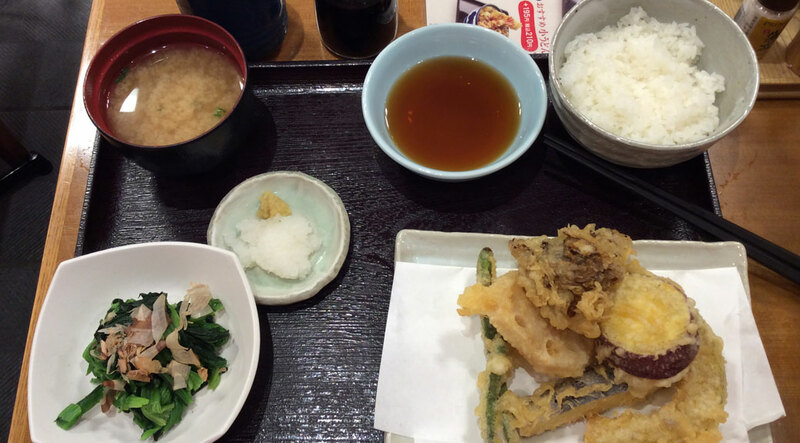 The best find, purely for convenience purposes, might have been Tempura Tendon Tenya. Located in Crea Mall, the open-air shopping hub in the heart of central Kawagoe, they have a full English menu (!!) and several set options. The rice set comes with all-you-can-eat rice and noodle sets are also available with soba or udon. The only “oops” in the meal was some dried fish shavings (katsuobushi) on the spinach, but it was easily brushed aside. Last weekend, we headed west (without our camera) on the JR Kawagoe train for the first time, pointed toward Alishan Organic Cafe in Hidaka City. Only three stops and a bus ride from our station, this will be a return destination. The cafe menu is 100% vegetarian and mixes a standard menu with seasonal specialties. We ordered a donburi bowl (rice bowl) with mock-meat and veggies and a teriyaki veggie burger. Both came with a salad and fried panko-crusted potato ball. Excellent, clean-tasting food. They also have a small store with hard-to-find organic and vegetarian products. I really enjoy cooking at home, but it’s also nice to find some places for those days where cooking just isn’t in the cards.